Those of you who have known me for a while will probably know that Tomb Raider 2: The Dagger of Xian is (and most likely always will be) my favourite Tomb Raider game. You might also know that I was interested in archaeology and ancient civilizations long before Ms Croft appeared on the game scene in 1996. But did you know that my interest in Tibetan culture was triggered by Tomb Raider 2? Before TR2 was released, Tibet was, in my younger, uninformed mind, a semi-mythical land of snowy mountains and meditating monks, little more than a real-life Shangri-La. I knew very little about its history, its cultural traditions or the Tibetan people’s lives under Chinese rule. But all that changed after playing TR2. I scoured my local library in search of books about Tibet (there were precious few), read and re-read Heinrich Harrer’s autobiographical travel book Seven Years in Tibet (I still have it), and bought a copy of the film adaptation starring Brad Pitt on VHS (remember those?). But enough about my personal history. Let’s examine some of the Buddhist symbols that can be spotted throughout Barkhang Monastery! If you’ve ever played this level, you may have had the feeling that you were always being watched. Wherever you went, you’d come across the same set of eyes staring at you from the monastery’s walls. Sometimes, they even seemed to move. The eyes keeping track of Lara’s antics were, in fact, those of the Buddha himself. Buddha eyes are normally painted on the four sides of the main tower of a Buddhist stupa (Tibetan: chorten), the semi-hemispherical, mound-like structures that often contain Buddhist relics and portray the Buddhist cosmos. This practice is commonly seen in Nepal (most notably on the Swayambhuanth stupa west of Kathmandu) but Buddha eyes can also be seen on the exterior of the Kumbum stupa in Gyantse, Tibet. The eyes face the four cardinal directions, symbolizing the all-seeing nature of the Buddha. Even Lara can’t escape his watchful eye. The curly symbol where the Buddha’s nose would be is thought to be a stylized version of the Nepalese numeral 1. This represents the unity of all things (a recurring theme in Buddhism) and reminds the faithful that there is only one way to reach enlightenment. That is, through the teachings of the Buddha. The dot between the Buddha’s eyebrows represents the Buddha’s third eye, a symbol which is common to Buddhist, Hindus and Taoists and which evokes a sense of spiritual awakening and wisdom. 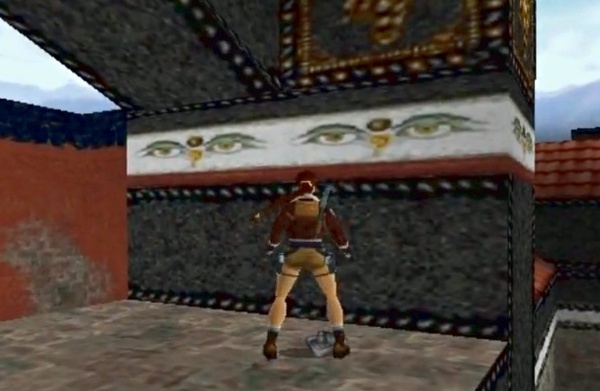 Eagle-eyed gamers may have noticed a recurring motif that adorns the banners that can be found hanging in the numerous corridors of the monastery. This diamond-shaped motif resembles the Endless Knot, one of the Eight Auspicious Symbols of Tibetan Buddhism. In Tibetan Buddhism, the Endless Knot represents the infinite wisdom, knowledge and compassion of the Buddha. Its right-angled, intertwined lines remind Buddhists of the core concept of cause and effect (or karma) and that all phenomena are interconnected. Just think back to the game. If Lara leaves the monks alone, they will help her take down Bartoli’s thugs. But if she shoots at a monk, even by accident, the monks will turn on her and make her life a little harder. How’s that for cause and effect? Endless Knots decorated with ceremonial silk scarves (or khata) can occasionally be seen in Buddhist art and you can find one such symbol on the gold disc near the entrance to the Catacombs of the Talion. It’s thought that the image of the knot and threaded scarves may have derived from an ancient Indian symbol depicting two intertwined stylized snakes (or naga), which symbolized harmony and the duality of the universe. Snakes were once revered throughout the Indian subcontinent and were thought to embody the concept of rebirth and renewal due to their ability to shed their skin. It doesn’t take a great stretch of the imagination to see why the ancient cultures of the Indus Valley and India would associate snakes with immortality. The Endless Knots of modern-day Tibet are far removed from their serpentine origins but they continue to be associated with eternity and immortality, much like the Solomon’s knot of ancient Rome and the Middle East. As for Lara, she would come face to face with naga lizards in a later adventure and luckily for her, they were very much mortal. That’s all for this edition of Arte-Factual. We will continue our examination of Barkhang Monastery in part 2 of “Buddhist Symbols of Barkhang Monastery”. Don’t miss it! Buddhist Symbols in Tibetan Culture by Dagyab Rinpoche, Wisdom Publications (1995). The Handbook of Tibetan Buddhist Symbols by Robert Beer, Serindia Publications (2003). I am looking forward to Part 2. Has it been posted yet, I can’t seem to find it. Also, reading this is making me want to play this game again, but I don’t have any platform to play it on! Ah, the nostalgia of the Venice levels, The Great Wall of China, and the underwater shipwreck! That part terrified me and I was always tempted to level skip! The Tibet/China portions of the game are truly rewarding experiences. The floating islands level is one of the most bizarre and unique level designs I’ve encountered in a Tomb Raider game. Tomb Raider 2 for me was the highlight of the series. The toned down story, the modernized/outdoor locations, the vehicles, etc. Great game! Do you have a PC? I think you can get TR2 via Steam these days. And I couldn’t agree more with what you say about TR2. None of the other TR games have surpassed it in terms of story and gameplay. TR2 was the 1st TR game I’ve played, and that is mainly the reason why it’s the best one for me also. I also agree that this level was one of the best in the entire series. I remember having fooled around the beggining of this level oftenly, where I would help the locals kill all the bad guys at the very beginning, then all of a sudden attack one of the locals and quickly run up to the ladder and stop while climbing and just watch them standing down there by the ladders and shouting those HUEHUE all the time till eventually they killed each other and only one left. Oh, good old times.